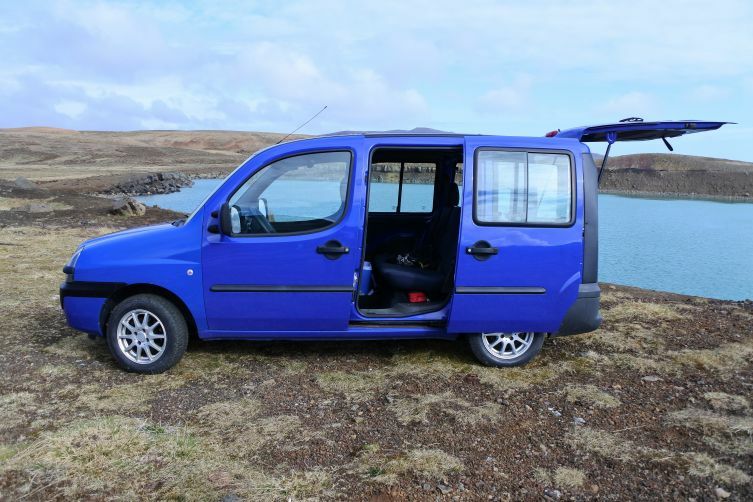 This Fiat Doblo camper is the perfect vehicle to travel throughout Iceland with your family. The car takes five people and three can sleep in the car. The sleeping area is very cozy and nice. It comes with a mattress and pillows. It is possible to rent a tent and sleeping bags with the car. The car is very spacious, you can stretch out your legs when sleeping and you can also sit up straight in the car. The well-designed and compact storage area comes with all the cooking gear you´ll need for your trip, as well as space to store your food. The car comes with cleaning equipment, torch and a fire extinguisher. There is a water container that stores 10L of water and a cooler that is insulated to keep food and beverages cool. It is possible to pick the car up at BSI bus terminal in Reykjavík, or at the airport but that costs 7300 ISK. It is possible to pickup the car and drop off between 8am and 23 or by an agreement. Perfect car for trip around Iceland! Very well equipped with all the stuff you need for camping. Thanks! Good car, a lot of equipments, I can recommend. Great communication with Daniel, I really enjoyed time on Iceland. Thank You! I have made a 9 days road trip around Iceland with the Car ("Fiat Doblo") from Daniel and the experience was really positive. The Car is dully prepared to make road trip, it is well conservated and the fuel consumption was really good. It has been an amazing trip! It was a wonderful experience thanks to Daniel's car! This camper is very well equipped and reliable! We recommand it warmly! This solution is better and really cheaper than camper agency in Iceland and has nothing to envy to them!